AR: Dutch Ministry of Defense Inmates Complain of Being Made "Accessories to Orangutan Killings"
Dutch Ministry of Defense Inmates Complain of Being Made "Accessories to Orangutan Killings"
The Sumatran rain forest is dying, and former colonial overlords in the Netherlands are still contributing to this devastation. Abreu Report was recently given a unique opportunity to interview individuals detained by the Marechaussee, the military police forces responsible for securing the borders of the Netherlands and protecting critical infrastructure -- such as the train station by Schipol Airport -- and one of the main complaints heard in the smoking yard, a small enclosure surrounded by concrete walls and covered by fence on top, was the food provided by the Ministry of Defense. For breakfast, detainees are provided a slab of jelly composed of high fructose corn syrup to be smeared on bread containing palm oil. Rafik, an Iraqi national detained because he flew into Schipol on an allegedly false passport, told Abreu Report that he wouldn't even feed that to a goat for breakfast, since both ingredients lead to serious health issues and contribute to the devastation of the environment. 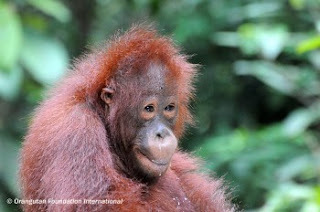 As Orangutan Fund International writes on its website: "The main threat to the survival of orangutan populations in the wild is the massive expansion of palm oil plantations in Borneo and Sumatra [formerly known as the Dutch East Indies]." Rafik, a short man in his late 20s escaping war with the hope of seeing his wife and children already settled in the Netherlands, told Abreu Report that he was "experiencing nightmares," that in his dreams the same devastation he saw the Islamic State unleash in his native Nineveh province would one day extend to Borneo and Sumatra, and that orangutans would be exterminated from the earth. Ronny, an American who'd been arrested 12 times in Poland and other parts of the European Union for unspecified non-serious offenses, was also tormented by what he'd learned from Rafik. "I don't see why Rafik should be made a party to this," said Ronny. "Palm oil products are killing orangutans." The Dutch Ministry of Defense was reluctant to release statistics, but an independent study suggests that should the military stop purchasing palm oil, it could significantly contribute to the possibility of survival for the world's orangutans. The Dutch East Indies no longer exists, but in the same way the Marechaussee guards have to care for the wellbeing of those suspected of immigration offenses, some would argue the Ministry of Defense has to stop contributing to the death of orangutans in the country's former colonies.